One of Bulawayo's leading giant supermarkets, Haddon and Sly Supermarket has reportedly closed due to operational challenges. According to the workers, the supermarket closed 5 days ago. It has been facing cash flow challenges resulting in failure to pay workers and restocking. "The shop was no longer restocking. Bosses were taking the money we cashed in daily to Harare instead of ordering stock. We made enough money to pay us and also order stock," said an employee who spoke on condition of anonymity. Employees on Saturday demonstrated against the closure of the shop, citing that management did not notify them despite owing them. "How can they close the shop without telling us? They have vanished with our outstanding salaries. 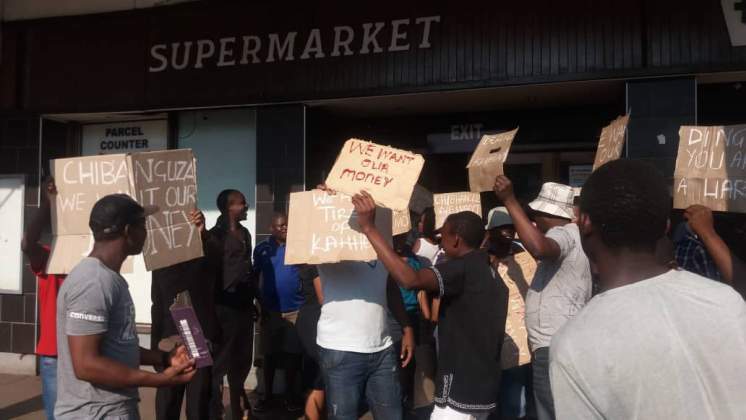 They should have paid us our money before closing their shop," said MaNcube, one of the employees. Workers stated their predicament started when their working hours were shortened to two weeks a month, resulting in salary cuts. In March this year, Haddon and Sly was taken to court by Safeguard, a security company for failure to pay $27 836.66 for services rendered to them for a period of five months. Haddon and Sly Limited was established in Bulawayo in 1894 as a general dealer by two traders who merged their businesses to suppress competition from other entrepreneurs. The original structure was demolished in 1907 to be replaced by the one that is currently standing although it has also been refurbished recently.